Delivery Time: We guarantee to mail the merchandise within seven working days after we received payment or after the check has cleared. Usually it is shipped within a day or two. Outside the U.S.: Add $30.00 for first class mail, $50.00 for priority mail (delivery time 6 - 10 business days) or $70.00 for priority mail express (delivery time 3 - 5 business days). Important Note: Phone Number must be Included if Outside US. Be sure to add cost of your preferred shipping. All contents Copyright © 1995 by HSCTI Inc. unless otherwise specified. All information received from this computer system is protected under international copyright law. All other copyright notices apply to their respective holders. H.S.C.T.I., Inc. disclaims all responsibility for any damages resulting from the use of information transmitted to or from this computer system. The Terms "Welz Chi Generator®," "Chi Generator®," "Orgonite®" and "Orgone Generator®" are registered trademarks of Hyper Space Communications and Technologies International. 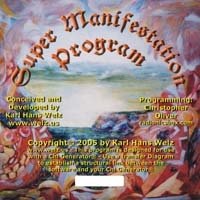 The most advanced of all manifestation programs, which allows you to set up any one of the previous programs, and then some ... You can install and run up to 22 positions each one with its own sound frequency. 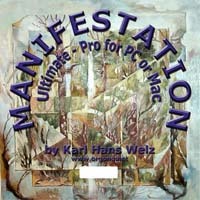 More than 1,500 filter symbols and many backgrounds and sounds to choose from. Structural Link to your Chi Generator® or Chi-Card® included.